You are here: Home / Health / 7 Natural Home Remedies for Cold, Flu, and Fever. 7 Natural Home Remedies for Cold, Flu, and Fever. 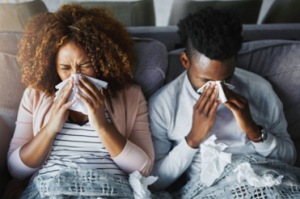 (ThyBlackMan.com) Cold, flu, and fever have made the most headlines in the last few months, and if you feel the signs of cold, you may want to think before turning to medicines. Luckily, there are some home remedies for relieving congestion, coughing, and fever. Here is a list of seven natural home remedies for cold, flu, and fever. Licorice is a natural herb which is used in form of the root of the plant. Take a bite of a small licorice stick and you might be surprised because it’s sweet inside. The compound that gives it sweetness is called glycyrrhizin and is used as an ancient herb for healing sore throat and congestion. The licorice powder is also used for skin treatment, indigestion, memory loss, hepatitis C, and cancer. Traditionally, it was used to treat heartburn, ulcers, and fever too. You can directly chew licorice sticks or you can consume licorice powder in small quantity. The powder’s dryness may cause irritation in the throat, so it’s better you consume it with lukewarm water. It’s never fun to feel sick due to weather or cold, and medicines don’t always work for everyone. If you want to avoid medicines, Kahwah tea is a perfect drink for aches, fever, and cough. Cold and flu remedies are often full of chemicals which you want to avoid, so thankfully nature has given us some great herbs. Kahwah is a traditional green tea and it is also called kehwa or kahwa. The tea is a mixture of boiled green tea leaves, cinnamon bark, saffron strands, cardamom pods, and Kashmiri roses. it tastes great and if you’re suffering from cough, cold and sore throat, it’s very effective. The ingredients in Kahwah are also excellent at fighting fever and cold symptoms at the root. You may have heard many people claiming that keeping an onion in the room can stop cold and flu. Everyone wants a quick remedy when they are sick, but keeping an onion in the room may not work. That’s not how science works. But it doesn’t mean that onion is useless. If you have a fever, apply mashed onion or onion juice on the bottom of your foot. If you can stand its smell, apply onion juice on your chest and back. Onion brings the body’s temperature down and it works very well. To reduce the smell, you can soak the whole onion in water for some time. For those suffering from cold and flu, you can chew a small piece of raw ginger because it helps in clearing the throat and congestion in chest. Ginger also helps in controlling cough and gives instant relief. If chewing ginger is not your thing then you can make ginger tea. Fever, cold and flu significantly reduce the water level in your body and often lead to dehydration. Avoiding alcohol is also good at such times. If you have fever, cold or flu, drink plenty of water to keep your body hydrated. Also, you can drink juices and other fluids to maintain the water level in your body. Be very careful with juices and fruits because some of them are not suitable when you have a cold or flu. You should also avoid dairy products including milk in fever. In fact, drinking milk can be dangerous as it creates problems in your digestive system, which is already fighting against an infection. Water is the best thing you can drink in fever, but if you want to drink something else, you can also add electrolytes to the water as the oral supplement will change the taste and it comes packed with essential vitamins and minerals. Fever slows down the movement of food in the body and it affects bowel movement. In such conditions, doctors often advise drinking more water and eating light food. Some people fast on pure water, but if you’re feeling weakness in the body, drinking bone broth is a lot better than fasting. Bone broth, when cooked properly, contains essential minerals which are helpful for the body especially if you have a cold and flu. Warm bone broth is an excellent remedy for cold as the spices release fluids in the mouth and reduce the mucus while making it easier for you to breathe. If your appetite is weak, bone broth can be helpful. People having a fever often feel problems due to weak immunity and digestion. Bone broth can help them. Fill your bathtub with hot water and add apple cider vinegar to it. Use only 1 or 2 cups of apple cider vinegar in the tub and take bath for at least 15-20 minutes. The warm water will help your body by reducing joint pain and in fever also, you can take bath in hot water. Some people prefer taking bath in cold water but it can be risky because the body starts producing more heat to get adjusted to the temperature of the water. After taking bath, the apple cider vinegar will dry on your skin. If you don’t like the smell of it, you can rinse it off in the shower. During the cold season, many people search for natural home remedies for cold, flu, and fever. Echinacea has long been said to prevent and reduce the ill effects of cold. There is mixed evidence that favors the use of echinacea as a cold killer, but studies suggest that it can reduce the risk by 10 to 20 percent. No research has shown the best remedy for cold, but the National Center for Complementary and Integrative Health supports the claim that echinacea can be considered a short-term supplement and it is safe if you use it in small quantities. Having fewer medication bills is good, but you should always do your homework before trying any kind of home treatment. Some home remedies don’t really work well, while others could actually be harmful if not taken in the right amount or in the right conditions. Business? Gaming? Health? Tech? and more… Send Tips To; JayBrown@ThyBlackMan.com.